A cup of chopped parsley provides 100 percent of your Vitamins A and C. It is a natural diuretic and thus aids in controlling high blood pressure. If you are on blood thinners or blood pressure medication, you should consult your medical professional before ingesting large amounts of parsley. 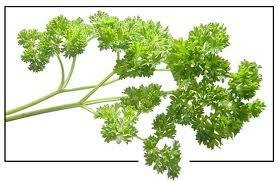 Parsley also improves the function of potassium in the body. Garlic is high in potassium. Anchovies are rich in Omega-3 fatty acids. 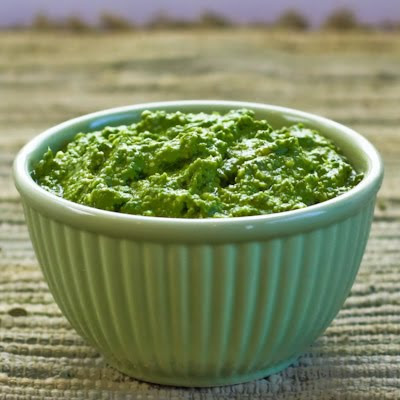 This pesto is good on steamed vegetables, or as a topping to soups and stews. Process the parsley in a food processor until it is roughly chopped. Add garlic through pepper flakes and pulse in. Add olive oil and lemon juice; pulse until fully incorporated. The pesto can be rough or smooth, according to your preference. Makes ½ cup of pesto. This entry was posted in Recipes, Recipes from Danielle's pantry, Sides, Vegetarian and tagged pesto, sauce, vegetarian. Bookmark the permalink.